When you select the "Remember me" check box and then log in, your username is stored on the computer you are currently using. When your username is saved, you will only need to enter your password. Because "Remember me" stores your username on the computer you're using, you should not use this feature on public computers (such as those in a library or internet café). Forgot the e-mail address used or your password? Member new to the site? Register here! or have not yet created your online account, please register now. Note: If you have joined via the site, the e-mail and password during sign-up is your login. 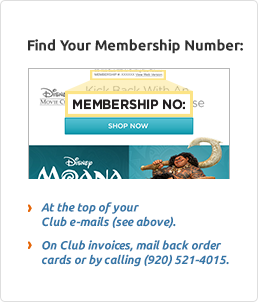 New to Disney Movie Club Member website? Enter your info below to set up your online account. If you joined via the site, the e-mail and password you provided during sign-up is your login. No spaces, hyphens, or periods.